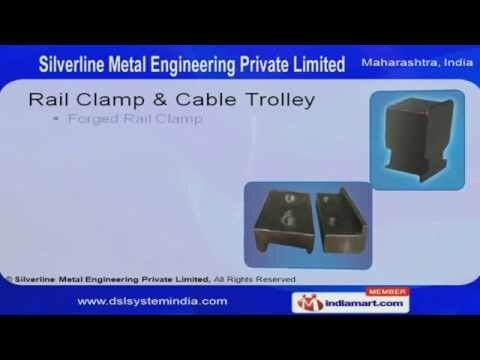 Welcome to Silverline Metal Engineering Private Limited, Manufacturer & Exporter of Steel Metal & Crane Components We are an ISO 9001:2000 certified company, established in 1994 at Navi Mumbai. L&T, Cadbury & Electromech are some of our elite clients. Specialized R&D wings, Competitive prices, timeliness & CAD / CAM designing facility are some of the key feature of our organization. Our product list includes DSL Systems, Rail Clamps, Cable Trolleys, Crane, Sheet Metal & Machine Components. We provide wide array of Track Couplers, Towing Trolleys, Wire Clip Plastic, End Power Feed Caps, Lug Joints, Hanger Clamps & Collecter Blackets. Along with that we offer End Caps, Forged Rail Clamps & Blocks at industry leading prices. We also offer Pallet Bowls, DSL & Rail Clamping Systems that are a class apart. End Carriage, Trolley Hoist (Crab) & Fabricated Parts are some of our best selling products. Our EOT, Light & Safety Cranes are setting a performance standard in the market.